A warning of unprecedented danger from the Source leads the New Gods to hide New Genesis itself, for Galactus is coming! Set prior to his first appearance, the Silver Surfer arrives on Apokolips, which he sees as fit for his masters consumption. Despite the efforts of Darkseids Parademons, the herald signals the world-devourer. 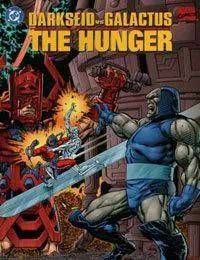 On New Genesis, Orion is not content to sit idly while Apokolips is destroyed, and so he flies into battle with the Silver Sufer, while Darkseid confronts Galactus for the fate of his world.